As a science teacher committed to inquiry-based learning, I was always wary of teaching excessive vocabulary to students. Scientific words without a strong connection to a real life experience lack meaning for students: sure they can “remember” them for a quiz, but this kind of knowledge is superficial and fleeting. Teaching scientific vocabulary seemed like a waste of time. Then I learned about word inquiry. Learning the meaning of words doesn’t have to be done by rote memorization, because words have inherent meaning- their specific combination of letters come from somewhere. By breaking a word down into its pieces and learning the origin and meaning of each piece you can learn the meaning of words in an inquiry-based way. In fact, many forward-thinking schools are now taking this approach to learning spelling. Gone are the days of the memorized spelling lists (those never worked very well for me anyway! ), now students investigate words by breaking them down with word matrices and studying the etymology of their pieces. Scientific vocabulary, with its linguistic origins rooted deeply in Latin and Greek, is perfect for this kind of word inquiry. 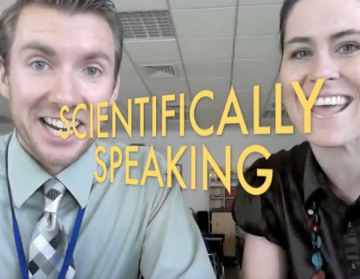 So this year I’ve teamed up with Katrina, our talented elementary Language Arts coordinator, to create a video series we call Scientifically Speaking. (Before you get all Kahn-descending about educational videos, please read my previous post on how videos can be used effectively.) The goal of Scientifically Speaking is to introduce the meaning of scientific words in an entertaining and memorable way, as a prelude or review to student-led word inquiry. In other words (no pun intended), the videos can be used by teachers to being a word study lesson that will investigate the meaning and spelling of other related words, or use them to review familiar words in a meaningful way. For more Scientifically Speaking videos about ecosystems, life cycles, and the water cycle, check out my Vimeo page. For more details about how to do a scientific word study, check out Pete Bower’s Scientifically Speaking page. Tacked on: these topics have performance expectations do not fit well with the central idea of the topic and in my opinion they add unnecessary breadth to the standards. Unfortunately, this “tacking-on” seems to be rampant in the standards, and I’d love to be able take a red pen to them. Example: The 1st grade Structure and Function topic focuses on… structure and function of plants and animals (duh) until it starts tacking on random expectations about heredity, parent behaviors, and communities. Bloated: these topics have so many big ideas slapped together that in my opinion it would impossible to address them together in any meaningful depth (without taking an impossible amount of time). For some reason is a problem in with 4th grade: Life cycles, Earth processes, and Energy are in need of some serious editing. Example: the 4th grade Earth Processes unit tries to combine weathering and erosion, fossils, and geological hazards all under one topic- yikes! Disastrous: these topics are a complete mess of barely related performance expectations, and contain no clear central idea as far as I can see. All 3 “disaster” topics are in Earth Science, so they’d better find a new team of geologists to fix these! Example: The 5th grade Earth Systems topic is all over the map including the different earth “spheres”, the workings of climate, the importance of the ocean, the water cycle without the cycling, and environmental conservation without climate change. Repetitive: these topics contain central ideas that are already addressed in an earlier grade’s topic, and without enough additional depth to justify further study. This could be cleaned up easily by combing some of these topics for more depth in one grade level. Example: In 2nd grade there is a Pushes and Pulls topic which overlaps a lot with the 3rd grade Interactions of Forces- why teach similar forces units two years in a row? Not age appropriate: these topics should be moved up to a higher grade level because it would be more fruitful to be able to investigate them in more depth with older students. Example: The Kg Weather topic would not include any quantitative data collecting like temperature and rainfall. Why not wait until students are ready to use meteorological tools to analyze the weather? Very good: these topics are clearly focused around a central idea and would allow for rich, inquiry-based learning. If only there were more of them! Overall, I believe the NGSS draft still has a long way to go to achieve its stated goal of more depth and less breadth in US science education, balancing emphasis on content with skills and cross-cutting concepts. The structure of the standards with 4 topics per grade level after 1st grade is a simple barrier in itself- it seems to imply that 4 science units would need to be taught each year, and many of these topical units are very broad in content as currently written. I would love to discuss the topics in more detail, and hear others’ takes on the standards. If you’re interested, check out the #NGSSChat on Twitter this Thursday at 8pm Eastern being organized by @FredEnde. That will be 3 in the morning for me in Qatar, but I think I’m actually nerdy enough to wake up for it! The Next Gen standards are based on the National Research Council’s Framework for K-12 Science Education. If you’ve read any of the NRC’s outstanding books on science education and learning in general, then you know that their work synthesizes the huge body of decades of research on learning. So they know what they are talking about! The NRC’s Framework proposed that new science standards have to include 3 elements: core content, scientific practices, and cross-cutting concepts. In other words, they recommended that the standards be focused on only the most important scientific content (to avoid the “mile wide and inch deep” curriculum), and put this content on equal footing with learning skills and big, interdisciplinary ideas that cut across different fields (such as patterns and cycles). Since past standards usually get caught up in the content (and lots of it), this is a big shift. How well do the Next Gen standards realize the Framework‘s vision? On the surface- very well! Each performance expectation in the standards is written with the practices, content, and cross-cutting concepts included in the sentence itself. For example, here’s a performance expectation for a 1st grade about plants and animals: “Obtain and share information to explain that patterns of behaviors between parents and offspring promote survival“. The skills (obtaining and sharing information) and the cross-cutting concept (patterns of behaviors) is right there, being used to describe the core content. In this way, teachers can go ahead and get myopic about the standards wording, because everything is already built into the standard itself. Very clever! A clear effort was made to ensure the standards are age-appropriate (unfortunately it looks like this was taken to a fault, but more on that later!) The focus is mostly on macroscopic, observable phenomenon that are easy for kids to investigate in a hands-on way. Often the data to be collected is explicitly qualitative, so that younger students don’t get bogged down in excessive measurement or needless precision. Many of the standards include “boundary statements” which are intended to give a clear idea of what is NOT included in the standard. There are a few items in the elementary standards that will raise your eyebrows about age-appropriateness, but for the most part it seems spot on. As a former engineering student I know I”m biased, but I think it’s great that engineering is finally being included in science standards- and in fact given almost equal weight with science itself! Throughout the standards their are explicit performance expectations for designing, modeling, and applying scientific knowledge to an engineering problem. I’ve always thought of engineering (and used it in my teaching) as the perfect tool for getting students to apply their knowledge and gain a deeper understanding, so it’s wonderful to see someone else agree! The elementary school standards are not banded, but grade-level specific, meaning the standards give specific performance expectations for Kindergarten, 1st grade, 2nd grade, etc. This is problematic for several reasons. First, it is going to make the standards difficult for schools to adopt- and this could even de-rail adoption at a larger national scale. What if your school doesn’t currently teach about sound and light in 1st grade? What if you teach it in 2nd grade or Kindergarten instead? According to the way the standards are written now, schools would have to fall in line with a very specific progression. But why is this level of specificity necessary? It’s difficult to see why some topics must be addressed in one grade but not in another. Since many of the topics are very independent, there’s no obvious or perfect learning progression,so I don’t see why the elementary expectations can just be banded to allow for more flexibility. When you read through the Next Gen standards they are organized by “topics”. There are 3 or 4 topics per grade level in elementary, so it’s very easy to think of them as units of study. However, in the introduction to how to read the standards, it states that: The performance expectations were initially written in topical groupings, but can also be viewed independently. Topical groupings of performance expectations do not imply a preferred ordering for instruction—nor should all performance expectations under one topic necessarily be taught in one course. The Next Gen standards made an attempt to reduce the overwhelming amount of scientific content that most current standards contain and focus on core ideas. But the draft only half achieves this. Many of the topics still read like laundry lists with too much content to be able to investigate and explore topics in depth. This is readily apparent when you start thinking of the topics as units. After 1st grade there are 4 topics per grade level, basically meaning 4 units a year, which is already one more unit that I currently teach each year. There is evidence of a lot of “tacking on” in many of the topics, with performance expectations that don’t fit with the core ideas of the topic. These need to be cut. If the standards are truly going to focus on core ideas, then only core ideas should make the cut. Otherwise the Next Gen standards will only be one step in the right direction, and not the bounding leap that we need instead! I know I’ve failed to blog much of anything the second half of this school year- but at least recently I’ve had a good excuse! 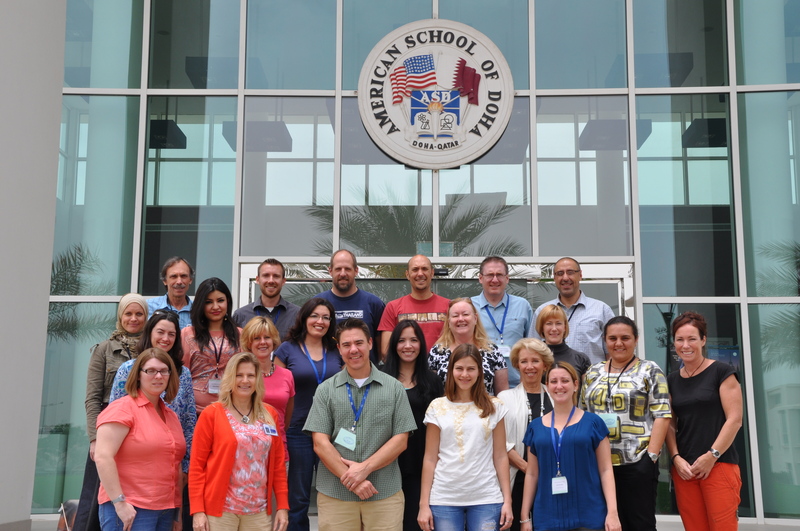 Last weekend I organized a Science Collaborative Workshop at my school, which brought together 21 science teachers (elementary and middle school) from 5 international schools. For 3 days we shared ideas, exchanged resources, and collaborated on science units we had in common. It was an invigorating and intense experience, but when the dust settled we had collaboratively created seven standards-based units that we will be able use ourselves and share with other international schools on our website (still under construction, but you can check out the Electricity unit for a preview of what’s to come). Not only is this true for magical baseball fields, it’s also true for teacher collaboration. Too often in education we teachers toil alone behind closed doors, when a conversation with a colleague would make all the difference. But collaborating can be challenging- you need to find the time to do it, you need to find the right person with something to offer, and it needs to be mutually beneficial to make the collaboration last. For our workshop we gathered teachers from 5 select schools where we knew they were experienced with aligning to the AERO science standards and also shared a similar philosophy for designing units with backwards design. So we all shared a common language about teaching and unit planning, and everyone had something to offer. We also put teachers in teams where they all taught similar grades and had a unit in common that they could work on together. So everyone was invested in the work because it was something they could actually use with their own students. Just getting this right group of people together in the same room was probably the most significant factor for the workshop’s success- with the right playing field set up the game happens naturally. One of my main goals for the workshop was to build collaborative relationships between teachers and schools, in other words I wanted to make sure people hit it off with teachers from other schools. So why not start off the workshop with a couple “ice breaker” activities? Because ice breakers have always annoyed me- I don’t know why exactly- but something about their contrived content and obvious purpose always makes me want to rebel and complete the silly activity without actually getting to know anyone. Can you tell I’m an introvert?? 🙂 However, I knew I couldn’t expect teams to dive into curriculum design work comfortably with complete strangers, so the compromise we came up with was science conversation starters. These were based on one of the best PD experiences I’ve ever had: the Summer Science Workshop at Dana Hall. The entire week of that workshop basically consisted of teachers engaging in hands-on inquiry activities with other teachers, and then reflecting on how the activities could be used with students. It was incredibly fun and thought-provoking, and the experience seeing through the eyes of a student and working side-by-side with my peers made a huge impression on me. (Side note- their brochure still has a picture of me in it, so maybe I made an impression on them too!) So each time we began work with a new group of teachers, we had them first do a short hands-on activity for about 30 minutes with minimal instructions: build a sail car powered by a fan from recycled materials, figure out how much water a carrot is made of, investigate whether ice melts faster in tap water or salt water. These activities sparked discussion, demanded creative thinking, and were just plain fun. By the end of the 30 minutes the mood was lively and the ice was broken- but best of all we were doing and thinking about science the whole time. How many times have you gone to a great presentation at a conference, filled up pages of notes with new ideas that you’re excited about trying with your students, and then promptly forgotten them all when Real Life runs you over like a truck when you get home? It happens all the time for me- if I don’t have a concrete plan or reason for using something immediately, it usually gets buried in the pile of good intentions. To avoid this fate for our collaborative workshop, we made sustaining collaboration one of our key goals and spent time during the workshop brainstorming and discussing ways to keep it going. Wheels are already in motion planning a second collaborative workshop for next fall, and each unit team is continuing to work together remotely to finish and publish their units online. Of course it remains to be seen how successful we are at this, but having a sustainability plan of action gives us a fighting chance.